Saint Petersburg Mosque was founded in 1910 in honour of the Emir of Bukhara, as a result of Central Asia joining Russia. This occurred under Tsar Alexander III, when the court was trying to respect the interests of the Muslim community in St Petersburg, in which there were more than 8,000 people. When opened in 1913, the mosque was the largest church in Russia. It can accommodate up to 5,000 worshippers. Two minarets reach 49 meters, and the dome rises 39 meters high. The location of the mosque was symbolic, sited opposite the Peter and Paul Fortress, in the city centre. The architect Nikolai Vasilyev patterned the mosque after the 15th century Samarkand building Gur-e-Amir, where Tamerlane’s ashes are kept. The dome is almost an exact copy. The permission to purchase the site was given by Emperor Nicholas II in Peterhof on 3 July 1907. That autumn, the committee approved the project. The architect was Nikolai Vasilyev, the engineer Stepan Krichinsky, and construction was overseen by academic Alexander von Hohen. 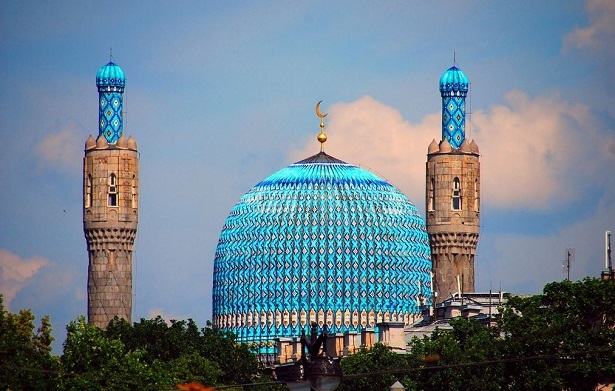 The building facade was made by combining both oriental ornaments and turquoise blue mosaic. A special committee was formed in 1906 to raise 750,000 rubles within 10 years for the construction of the mosque. It organised collections in Russian towns and provinces, receiving donations from many sponsors. The biggest donor was Said Abdoul Ahad, Emir of Bukhara, who undertook all expenses for the building. Skilled craftsmen from Central Asia took part working on the mosque. The facades are decorated with sayings from the Koran in characteristic kufi and suls scripts. Internal columns are made from green marble. Women pray on the first floor, above the western part of the hall. The mosque was covered in huge carpets, especially woven by Central Asian craftsmen. In 1940 Soviet authorities banned services and turned the building into a medical equipment storehouse. At the request of the first Indonesian President, Sukarno, ten days after his visit to the city, the mosque was returned to the Muslim Religious community of St. Petersburg in 1956. A major restoration of the mosque was undertaken in 1980 and again in 2017. On an Uzbek Journeys tour, you will have the chance to see the Emir Of Bukhara's Summer Palace. The Emir also built the extravagant Kagan Palace, near Bukhara, which was built for a visit of Tsar Nicholas II to Turkestan, which did not eventuate. If you go to St Petersburg prior to or after Central Asia, then a visit to this mosque should definitely be on your program. 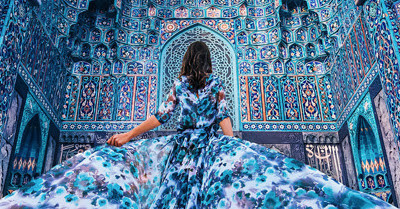 Samarkand to Delhi: Timurid-Mughal 21st century connection (this features Gur-e-Amir which was used as the model for the St Petersburg mosque).